Lewes – U.S. Representative Lisa Blunt Rochester and Transportation Secretary Jennifer Cohan, joined Delaware Transit Corporation (DTC) CEO John Sisson and other state and local officials to cut the ribbon for the Lewes Transit Center along DE 1, just south of Five Points on May 12. The first phase of the Lewes Transit Center project is complete with a 248-space Park & Ride with security cameras, bicycle racks and repair station, as well as electric car charging stations and temporary passenger amenities, including a ticket booth to sell the newly available 7-Day Pass. A large canopy will be installed this fall equipped with LED lighting and phone charging stations. “Our beach resorts are a destination for hundreds of thousands every year and a key economic driver for our state. 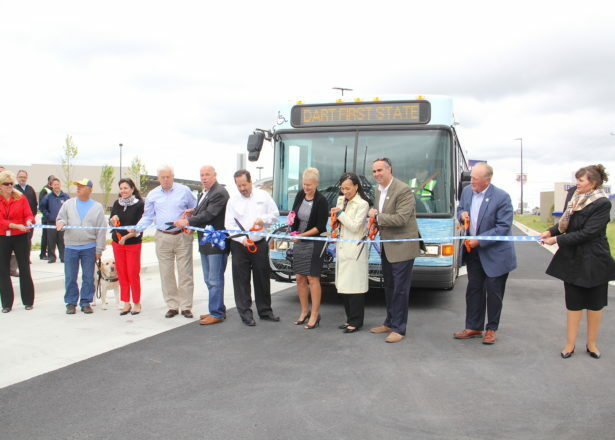 This new transit center will provide both residents and guests easier access to all the local amenities our resort towns have to offer,” said Governor John Carney. The three-bay maintenance facility designed for both gas and alternate fuel buses is slated for completion mid-2019. Having a maintenance facility on the eastern side of Sussex County will greatly improve the efficiency of DART’s transit service, lending itself to year-round service, as well as making express service between Lewes and Dover a reality. Funding for the Transit Center comes in part from the Federal Transit Administration’s State of Good Repair Grant of $5 million, as well as its 5311 Rural Transportation Assistance Program. “The Lewes Transit Center is a great example of what happens when state and local governments partner together to solve problems. The new center will encourage ride-sharing and help promote the use of mass-transportation in one of our state’s most congested areas,” said U.S. Sen. Tom Carper, ranking member on the Environment and Public Works committee. “Since this hub will help reduce vehicle emissions and ease congestion, it will be a win-win for both the environment and our tourism industry." The new Lewes Park & Ride opened for service on Saturday, May 6, providing weekend Beach Bus service on the 201 Red Line to Rehoboth Boardwalk. The 208 Blue Line also started weekend service from Rehoboth Park & Ride to Ocean City, MD. The Lewes Park & Ride’s northern location, providing direct access to/from DE 1, offers travelers an option before getting into the heaviest beach congestion, and parking is free. The buses will travel in the Buses Only lane between the two Park & Rides, passing by the heavy traffic. 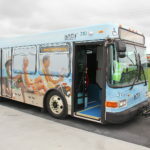 On Monday, May 22, the daily Beach Bus services begin operating frequent service on seven bus routes serving the NEW Lewes Park & Ride, Rehoboth Beach and the Boardwalk, Lewes, Long Neck, Dewey Beach, Ruddertowne, Bethany Beach, South Bethany Beach, Fenwick Island, and Ocean City, MD. The service operates 7 days a week from approximately 7 AM to 2 AM, with more frequency than ever before. All buses are air-conditioned, ADA accessible and equipped with bike racks. 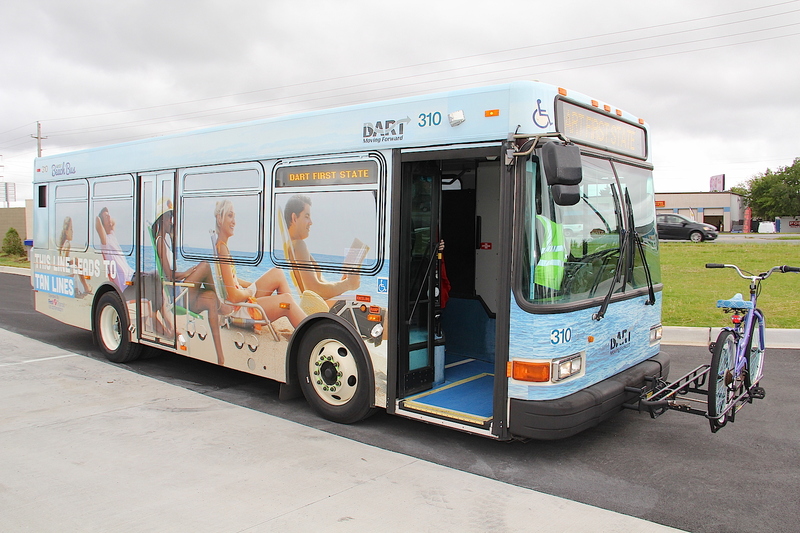 DART's 305 Beach Connection starts on Friday, May 26, providing a relaxing ride from Wilmington to Rehoboth Beach on Friday nights, Saturdays, Sundays and holidays through September 4. The fares have been reduced to $2 per zone, making it a much more economical ride. Now, the one-way cash fare is $10 from Wilmington, $8 from Middletown and $6 from Dover. Riders are encouraged to buy a 3-Zone Anywhere pass for $12.60, which can also be used on all Beach Bus services, once at either of the Park & Rides. In addition to the new Lewes Park & Ride, DART continues to offer Beach Bus service from the Rehoboth Park & Ride. The parking fee is $10/vehicle and includes up to 4 Daily Passes. DART’s Real-Time bus information is now available on the DelDOT mobile app. Riders can select any bus stop and receive bus arrival times and live updates to plan their trip right down to the minute. The Delaware Transit Corporation, a subsidiary of the Delaware Department of Transportation (DelDOT), operates DART First State. For information on fixed route bus services statewide, please call 1-800-652-DART or visit www.DartFirstState.com.